I have 3 very active boys and a husband who is in the construction field so you know what that means – a whole lot of dirty, stinky clothes. I have always been very picky about my detergent, cost didn’t matter as long as it cleaned well, didn’t fade the colors, and it had to smell really good (that was my payoff for doing this daunting task). My detergent of choice was Tide Mountain Spring, so when our income was drastically reduced I could no longer justify paying $17.97 (Walmart price) for laundry detergent. Add in the fabric softener and we were paying over $150 a year and that’s not including the stain removers, bleach, water or electric. Ridiculous!!! With this big change in our income, I had to find ways to cut costs without sacrificing our needs. When I began looking at our spending habits I knew that one of the places that I needed to start was is in the laundry room. I’m a researcher by nature so I began looking for ways to cut our laundry costs. I found several homemade laundry detergent recipes, I was a bit apprehensive but when I saw the price difference I thought I would give it a try. I took several of the recipes that I found, tested and tweaked them and came up with what in my opinion out cleans the brand that I used for years. Layer the all of the ingredients in a large bucket or container and mix. If you’re using a hand grater, use the fine side. To mix, we use a 5-gallon bucket with the lid securely attached and let the kids roll it around for awhile. Use more of the Purex Complete Crystals for a stronger scent or none if you don’t like scented detergent. DON’T use more than 2 tablespoons per load. This detergent doesn’t contain any fillers like the name brands. This is a suds free detergent so it is safe to use in High Efficiency (HE) washers. You will only need to use about 1-2 Tablespoons per load depending on the size of your load. I know that sounds crazy, but this is pure detergent it has no fillers like the name brands do. At first, you will have that urge to add more, but don’t, 1-2 Tablespoons is all you need – Trust Me! Also, this is a suds free laundry detergent so DON”T add more hoping for suds to form, because it won’t happen. Because this detergent doesn’t sud up it’s perfect for High Efficiency (HE) Washers too. Now let’s discuss the savings. This recipe makes approximately 325 loads, more if you are only doing small loads and using 1 Tablespoon instead of 2. The cost break down is only $0.09 per load, where with the Tide we were paying $0.29 per load. That is a savings of $0.20 per load or to look at another way $2.00 per week, $8.00 per month or $104.00 per year. So if the quality of this doesn’t motivate you I’m sure the savings will. A&H Washing Soda – detergent booster, freshening agent, stain fighter and is 100% natural. A&H Baking Soda – stain fighter, deodorizer, makes whites whiter, brights brighter, odor free, fabric softener and is 100% pure. Fels Naptha – stain remover, pre-treater. Purex Complere Crystals – freshens clothes, makes them smell so darn good and is 87% natural. Give it a try and then come back and tell us what you think. I've used it for a week. I still use a dryer sheet for the static and scent so I didnt need the double crystals. Everything smells great and looks clean. Even the dog blankets! I'm so glad you like it. Now check out my homemade fabric softener, it works great too. I tried this recipe with only two bars of Felsnaptha. Should I increase it to 5? Have my clothes not been as clean as I thought they were? I would suggest using 5 bars! There is a ratio of Fels Naptha to the other ingredients in the recipe. 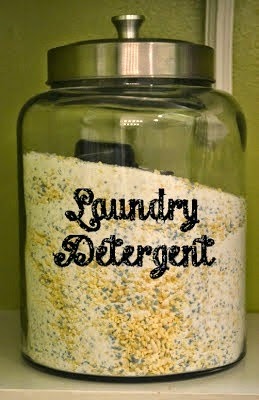 I have been using home made laundry detergent for over a year now. I love it. For those of you concerned with static – Fill a Downy Ball with vinegar. It softens and the smell dissipates. Rather than using that plastic-y filmy fabric softener and dryer sheets, I use a foil ball in the dryer. Positive and negative charges and such. I have not had static cling since using it. Just loosly wad up foil into a ball and toss it in the dryer. You re-use the same ball till you notice the loose ball start to get tighter and smaller. Tons of $$$ saved. I buy the cheapest foil for this and keep it in the laundry room. FYI…If you want to save some life on your dryer. Remove the mesh/vent lint catcher and really wash it. Wash with soap and hot water. It removes the plastic-y film from using fabric softener and dryer sheets and will save the heating element in the dryer. Does the bar screw up the food processor? No! The density of the bar is similar to that of a carrot. If you put the Fels Naptha in the freezer, it is very easy to hand grate…. Freeze the bars before hand grating. They grate faster and easier. Do we need to make it into a liquid for front loader machines? Mishqueen, I've been making a similar recipe for about 7 years now BECAUSE I have a front loader and was tired of the moldy smell and scum around the rubber gasket in the front. That comes from liquid laundry detergent. Once I switched to dry DIY, I've had no more problems. So in the front loading washer do you put it inside the washer or in the comparymnet where the liquid detergent goes? It goes in the compartment. I have an HE washer too. Since using homemade detergant and fabric softner I have never had odor or and problems with it . I think it might be the borax , washing soda , and baking soda in the detergant and the vinager in the homemade fabric softner. I love it . No need to spend additional money in HE washer cleaners. Great stuff, I’ve never had a problem with odors either. Microwave the Fels Naptha first. It expands to 3 times the size and looks like a sponge. Cut it with a kitchen knife into chunks, then throw them n the food processor. End result is a very fine powder, just like the brand names. You just have to watch it. Here's an article (with pictures) on how it should look after microwaving. Monica, you can find everything on the list at Walmart. I'm about to run out myself after almost 6 months, so I'll be taking a trip to Walmart this weekend to pick up everything that I need. The last time I made it I only spent about $30.00, I wonder if the prices have changed much since then. I got all ingredients at Walmart for $20,I live in southern California. For front loading washers, can we put it in the detergent dispenser or do we need to put it right into the barrel with the clothes? I made this for the first time this year and gave some to some close friends and family to also try. My brother works at Discount tire and his clothes get sssssoooo dirty, when he tried his new detergent, he was amazed at how clean his pants were, he said they looked brand new! He loves this detergent!! Another friend has really, really sensitive skin, she loved how natural it was and that it didn’t make her break out. I love this detergent! I didn’t see the side note to add a 2nd bottle of purex for extra scent til after I made it so I put unstopables in with mine and is ok to use Tide Oxi clean instead of Oxi Clean? I love to hear how much you like it! I would stick with just OxyClean, the Tide OxyClean has other additives and it might make the water to soapy. I am pretty excited to give this a try. I am getting my list together before heading out to the store and I have a couple questions. Your recipe calls for Purex Complete Crystal Laundry Enhancer at 55 oz. However, I cannot find that on the Purex website. Do you use Purex Classic Dry Laundry Detergent in the 71 or 50 oz box? Or do you use Purex Crystals in the 18, 24 or 48 oz bottles? I use the Purex Crystals. Any size bottle will do. All the crystals do is add a scent to the detergent, so if you want a stronger scent add more, less of a scent add less, it’s up to you. I have a five-month-old who has reacted in the past to OxiClean 🙁 Can I leave it out?? You can try, I’m just not sure if it will be as effective. I’ve always made it with the OxiClean. You can make homemade OxiClean using baking soda, peroxide and water, so I would say just add a little peroxide when you wash. Peroxide is natural and just helps the cleaners react faster by breaking down the stains. I have cleaned 2 wedding dresses with Peroxide, baking soda, water, and a little Dawn detergent. First had wine spilled down the back, drinks, and other things spilled on it and swept the drinks spilled on the dance floor along with items tracked on the floor. The bottom was very dirty. to say the least. The second had tar stains from recently resealed asphalt drive, dirt from the walkways and floor, and dirt and particles from the sand beach. Both came out clean and white. Things the dry cleaners said may or may not come out.. Had to treat the first one a couple times because the bottom was really dirty and it was a real full wedding gown. I have also cleaned my twin granddaughters clothes. They are very into getting dirty and only thing I have not been able to get out was dry erase marker that I did not know they had gotten into until later. You use 1 part hydrogen peroxide, 1 part baking soda, and 2 parts water with a small amount of Dawn detergent. What a great tip! I use peroxide in a lot of different applications, it’s amazing stuff. Have you ever tried a smaller batch than what you have listed in this recipe? Sorry I’ve always done it in a large batch. I don”t use oxyclean due to past reaction. I also use Zote which is a 13.0 ounce bar compared to the fels-Naptha at 5.0 ounces. They cost the same at my local wal mart. I also use the Purex 2 stain fighter + bright booster. My whites appear whiter and the colored clothes are brighter. I can across your recipe on Pinterest. I’m not a big van on using borax in any of my homemade products. I’d like to try and make this but would it still work ok without the borax? Is there something else I can use in place of borax? I’ve never made it without borax but I suppose you could replace it with more washing soda. They are very similar, but I can’t guarantee that it would be as effective. I make a detergent similar to this that does not call for Borax or the crystals for the smell. It works great. I do sometimes add borax to my wash, but not always. I adding the crystals, it gives the laundry such a fresh smell. 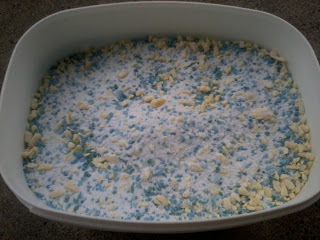 I also make my own powdered laundry detergent. The only differences are that I only use 2 bars of soap and instead of grating them I place them in the microwave for about 2 minutes, one bar at a time. This will cause the soap to “morph” and swell. after the bars have been nuked, let the m cool completely. It will cause the bars to literally crumble in your hands. When it is completely cool, I them pulverize them in the microwave and proceed mixing all the ingredients together! I hated grating the soap and getting bloody knuckles. I love it too! It’s mild enough for the kids but tough enough to wash the husbands work clothes. Fels-naptha soap can be bought already grated…a box is inexpensive and no hand grating is required. That’s great news! Where do you find it? I need to make a smaller batch what are the amounts of each ingredient? I’ve never made smaller batches. Try using half of the ingredients listed to make a smaller batch.